It’s as if someone was given the task of writing a public information sign that broke every rule... and exceeded all expectations. Where to begin? I suppose a comma after ‘alarm’ might have helped – but not with the hanging clause at the beginning of this awful excuse for a sentence. No, the staff will not be pulling the cord – unless they are in there with you already – it is ‘you’ who will pull the cord. 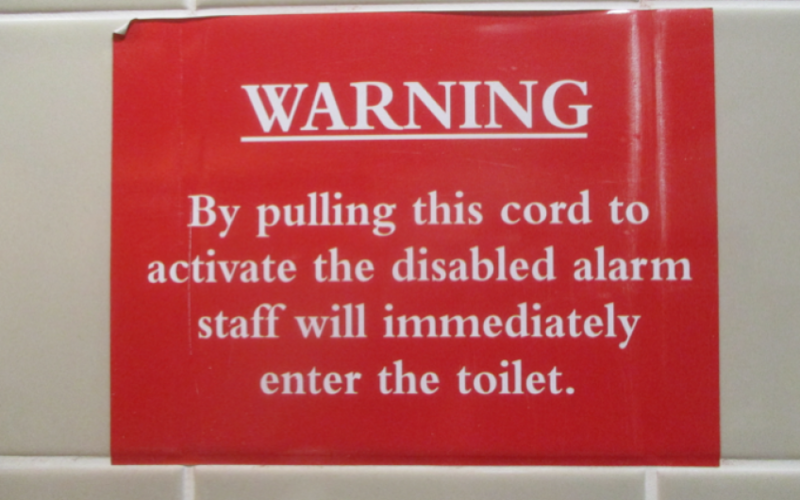 And if the alarm is ‘disabled’, how is it going to work? And maybe it’s me, but the slightly disturbing picture created by ‘staff will immediately enter the toilet’ is one of someone diving headfirst into the porcelain and disappearing. Anyway I wouldn’t have held out too much hope for the staff in this Costa knowing what to do in an emergency. From what I could gather, they didn’t even have English as a second language – maybe a third. When the woman at the table next to me asked for water, the waitress brought her a fork. When the woman said, ‘No, water, in a glass or a jug’, miming the shape of a container, the waitress then brought her an empty teapot. At the third go, the customer finally got her glass of water. She was lucky that she hadn’t collapsed in the loo, struggling to reach the emergency cord... or to understand that sign.